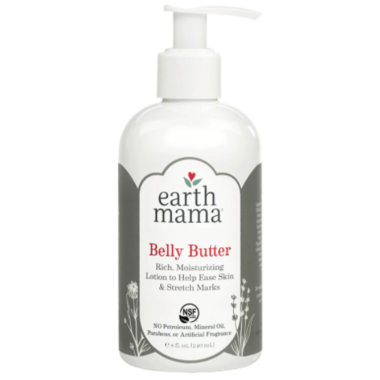 Rich, emollient Earth Mama Organics Belly Buttercombines organic Borage oil and Neroli pure essential oil with organic Shea butter and Calendula in a luxurious safe-for-pregnancy lotion that won't aggravate morning sickness. This herb infused emollient blend comforts pregnancy’s itchy, stretching stomach, breasts and hips to help discourage stretch marks, and is the safest lotion you’ll find, for pregnancy or every day. Ingredients: Aloe barbadensis (organic aloe) leaf juice extract, Olea europaea (organic olive) fruit oil, Helianthus annuus (organic sunflower) seed oil, Kosher vegetable glycerin, Butyrospermum parkii (organic shea) butter, Olivoyl hydrolyzed oat protein, Cetearyl alcohol, Glyceryl oleate, Glyceryl stearate, Citrus sinensis (organic sweet orange), Aspalathus linearis (organic rooibos) leaf extract, Simmondsia chinensis (organic jojoba) seed oil, Calendula officinalis (organic calendula) flower extract, Borago officinalis (organic borage) seed oil, Rubus idaeus (organic red raspberry) seed oil, Citrus aurantium amara (neroli) oil, Vanilla planifolia (organic vanilla) fruit extract, Xanthan gum. Please Note: Earth Mama Angel Baby has gone through packaging and name change. You may receive the original packaging as shown below. I love this belly balm so much that Iâ€™ve continued to use it as an all over body lotion even after pregnancy. Itâ€™s lightweight and absorbs nicely to leave supple, moisturized skin. The smell is citrusy but subtle. Itâ€™s also really helped smooth the keratosis pilaris on my arms. I absolutely love this product and all the other Earth Mama products I have used! I am 35 weeks pregnant and have been using this daily since around 10 weeks and don't have any stretch marks. I also find it helps relieve my itchy belly and it smells great! Smells great, goes on nicely and dries quickly. Doesnâ€™t leave an oily residue. Definitely will be buying more! Stronger smell than I expected (however not bad enough to contribute to my morning sickness). Absorbs well and feels really nice! This cream smells great (not overpowering) and feels good on my pregnant belly. I am already on my second bottle and I'll likely be ordering a new one soon! It smells wonderful, applies on smoothly, dries pretty quickly and not oily feeling, will definitely need a few more bottles to last the rest of pregnancy! I love this product and use itmorning and night. The texture is smooth and creamy, but not too thick. It absorbs quickly and has a light soothing scent. So far not showing signs of stretch marks and think this product is definitely helping! Love it. The smell is surprisingly pleasant and it really moisturizes my skin. Use it on my face, mama marks and on my tattoos. This works really well on my dry skin. I love this moisturizer. It's not too runny and the essential oils do wonders for my dry skin. Also, the smell is delightful. I've used it on my face every day throughout my pregnancy as I tend to have dry, red patches, and it works wonderfully. I also used it on my 5-year-old who has sensitive, eczema-prone skin and it did a wonderful job. Best moisturizer I have ever used! I have the hardest time finding a product that is actually hydrating and not only is this product extremely hydrating but the ingredients are all natural and you feel great using it. This is my new favourite product that I will use even when I am not pregnant. It has a light creamy orange smell like a creamcicle. Absolutely LOVE this product!! Smells great, goes on nicely, (not greasy at all), and it's the best price I could find!! Thank you for having it available well.ca! :) Will buy again for sure!